This paper highlights three recently published benchmark results that were achieved by Lenovo X6 high-end servers on the SAP Business Warehouse-Enhanced Mixed Load (SAP BW-EML) standard application benchmark. 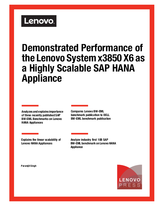 The paper shows the superior, near-linear scaling with larger data volumes, more nodes and higher processor core count that is delivered by the Lenovo System x3850 X6 workload-optimized solution for the SAP HANA platform. This paper also compares Lenovo publications to Dell publications to show the superior scalability of Lenovo HANA appliances. This paper is for customers who want to understand how the x3850 X6 is an ideal platform for SAP HANA implementations that can be easily and effectively scaled over time as business needs arise..